The JW837 is a copy of the Gibson J200 jumbo. It appears to have solid sides and back, and a solid spruce top. The pickguard is heavily engraved, to match the Gibson. The Jedson does not have the "mustache" bridge design. The JW837 has a three-piece back while the Gibson has a standard two-piece back. This is a 000-size guitar having specifications very similar to the Martin 000-28. The F907 is generally found with laminated rosewood back and sides with a solid-spruce top. The model samples are consistent in the style of the spruce top; however, there is significant variation in the sides and back woods. A few appear to have flat-sawn veneer and others appear to have quarter-sawn veneer. The T1000 is identical to the F907. Interestingly, a Terada-branded T1000 exists - see below. This appears to be the most current Jedson dreadnought. It generally comes with rosewood sides and back (probably laminated) and a solid spruce top. The FW913 comes with an adjustable bridge saddle like other Jedsons and Terada guitars. An early Jedson guitar having mahogany sides and back. 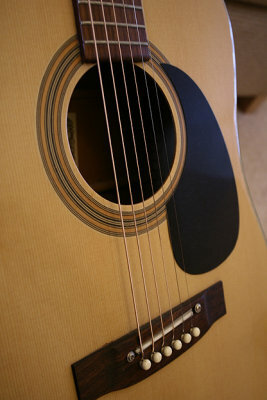 The guitar has a standard "non-adjustable" bridge. This is a very rare Jedson model that seems to resemble the 9000. Very few photos are available.